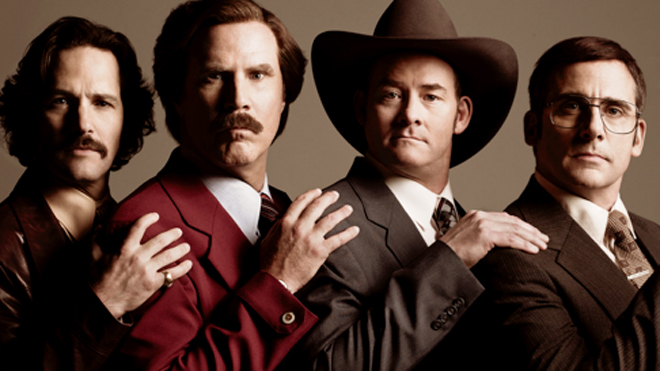 Anchorman 2: The Legend Continues….On? Remember way back at the end of October when Adam McKay told us that for every joke we laugh at in one of his movies that there are at least a dozen jokes that didn’t make it into the final cut? Then he told us he was wanting to ultimately re-release ‘Anchorman 2: The Legend Continues‘ with an entirely different version than originally seen in theaters? OK, well, if you remember that, THAT is what is going to happen! The mind boggles that there is more to be added, but there is a lot! The New York Times has labeled it ‘Anchorman 2 1/2’.Hopefully you haven’t reached your ‘Anchorman‘ quota because even if you watched the release of the second film, there’s a whole new version heading to theaters! Including…believe it or not….763 alternate jokes!!! You know that’s going to take the original PG-13 version and destroy it. It will play an exclusive one week run starting February 28.We don’t have a full list of theaters that will run it, but it should be posted any day. In the meantime check out the trailer for the new version! This entry was posted on Friday, February 21st, 2014 at 1:55 pm	and is filed under Film, News. You can follow any responses to this entry through the RSS 2.0 feed. You can skip to the end and leave a response. Pinging is currently not allowed. « Edward Norton Turns to ‘Motherless Brooklyn’! !